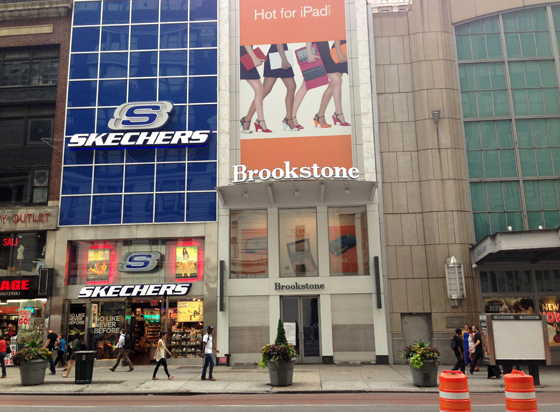 That was fast: Kids Foot Locker is taking over the recently closed Brookstone space at 142 West 34th. An article in Real Estate Weekly yesterday, titled "Foot Locker loves 34th Street," states "The retailer was so eager to secure the space, it will leave three of the buildings' five floors empty, selling from built out space on the first and second floors when it takes occupancy in August." This new Kids Foot Locker joins the company's other brick and mortar stores on 34th Street including House of Hoops at 11 West 34th, Foot Locker, currently including Kids and Lady, at 120 West 34th, and Footaction at 225 West 34th. Clearly, 34th Street loves you back, Foot Locker.